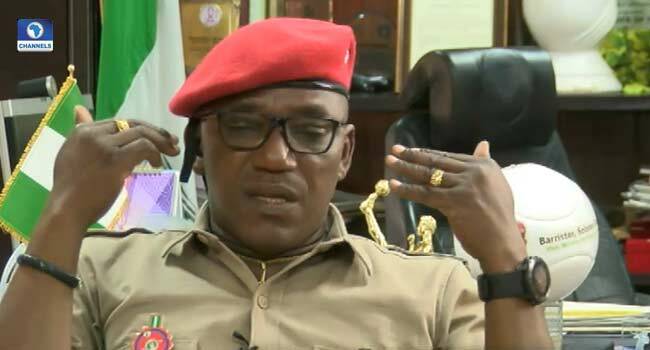 The Minister of Youths and Sports Development, Barrister Solomon Dalung, has dismissed speculations that his ministry and the Nigeria Football Federation (NFF) are having conflicts. While stating that there was no such thing, Dalung, however, criticised the NFF for allegedly spending resources on frivolities rather than the welfare of the players. He insisted that the nation’s football governing body must obey existing rules in the conduct of its operations. “I think peace has finally come to the Nigerian football with this policy that we are looking at players only. NFF must respect rules” he said Tuesday, on Channels Television’s Sports Tonight. Minister of Youths and Sports Development, Barrister Solomon Dalung. According to him, the decision of the Federal Government to concentrate on players during tournaments would enable the nation’s football body to be innovative. On the recent crisis that rocked NFF, the Minister explained that the problem would have escalated if he had not handled it properly. “If I were not a simple and kind person, there would have been more trouble than you are seeing. As a Minister, NFF invited me to attend their Annual General Meeting in Lagos, and when I got to Lagos, they did not provide accommodation for me. And they provided accommodation for even friends that they brought to watch,” he said. When asked why he was absent at the NFF elections which held in Katsina State in September last year, the Minister blamed his absence on an existing judgment of the Supreme Court. Being a lawyer himself, he vowed not to disobey the court judgment.